A definite area of plane surface, considered in relation to some specific object. auditory field the space or range within which stimuli may be perceived as sound. 1 a defined space, area, or distance. The field of vision represents the total area that can be seen with one fixed eye. The binocular field is the area that can be seen with both eyes. 2 an area within a computer record where a specified type of data is stored. A locus on a data collection tool—usually a case report form—for recording or displaying a data element. n three-dimensional zone in which an array of forces interact in tangible, recognizable ways. binocular visual field An approximately circular zone of radius about 60º centred on the point of fixation (slightly larger in the lower part of the field) in which an object stimulates both retinas simultaneously. Beyond that area on each side, the visual field is monocular. See visual field. field of excursion See field of fixation. field of fixation The area in space over which an eye can fixate when the head remains stationary. The field of fixation is smaller than the field of vision. It extends to approximately 47º temporally, 45º nasally, 43º upward and 50º downward. Syn. field of excursion; motor field. See apparent field of view; real field of view; visual field. keyhole visual field A term used to describe a visual field defect in which there is a bilateral homonymous hemianopia with macular sparing. An occipital lobe lesion sparing the posterior tips of the occipital lobe usually causes this lesion. motor field See field of fixation. 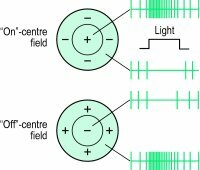 receptive field The retinal area within which a light stimulus can produce a potential difference in a single cell. Retinal ganglion receptive fields are circular, often with a response different in the centre than in the periphery (also referred to as on-centre/off-centre or centre/surround organization). Ganglion cell receptive fields are very small in the macular region and large in the periphery of the retina. Receptive fields also exist in the lateral geniculate bodies where they are similar to those of the retina. In the visual cortex they have various shapes and sizes and may only respond to either a vertical bar or a black dot moving in a given direction and at a given speed, etc. Receptive fields reflect the interaction between excitation and inhibition between neighbouring neurons. The term can also describe the region of space that induces these neural responses (Fig. F2). See complex cell; hypercomplex cell; simple cell; lateral inhibition; summation. surrounding field That area of the field of view surrounding any object. field of view The extent of an object plane seen through an optical instrument. field of view, apparent Angle subtended by the exit port of a sighting instrument or an empty frame aperture at the centre of the entrance pupil of the eye. Syn. apparent peripheral field of view. Note: when referring to the apparent field of fixation, the reference point is the centre of rotation of the eye. Syn. apparent macular field of view (Fig. F3). See field of fixation. field of view, real Angle subtended by the effective diameter of a lens at the point conjugate with the centre of the entrance pupil of the eye. Syn. real peripheral field of view; true field of view. Note: when referring to the real field of fixation, the reference point is the centre of rotation of the eye. Syn. real macular field of view (Fig. F3). See jack-in-the-box phenomenon. visual field (VF) The extent of space in which objects are visible to an eye in a given position. The extent of the visual field tends to diminish with age. The visual field can be measured either monocularly or binocularly. In the horizontal plane meridian the visual field extends to nearly 190º with both eyes open, the area seen binocularly, that is the region where both eyes can see the simulus is about 120º, and the area seen by one eye only is about 154º. Syn. field of vision. See binocular visual field; kinetic perimetry; static perimetry; confrontation test; island of vision. visual field expander An optical system designed to enlarge the field of vision. The most common types are reverse telescopes (e.g. looking through the objective of a galilean telescope), which minify objects being viewed but present more information by means of the enlarged visual field. They are usually of low power because of the reduction in visual acuity induced by the minification of the image. Prisms can also be used to expand the visual field. These systems are used mainly to improve mobility in patients with glaucoma and retinitis pigmentosa who have constricted visual fields or tunnel vision. n an area, region, or space. n the area immediately surrounding and directly involved in a treatment procedure (e.g., all the teeth included in a rubber dam application for the restoration of a single tooth or portions thereof). n the region in which radiant energy is being propagated. 1. an area or open space, such as an operative field or visual field. 2. a range of specialization in knowledge, study or occupation. the space or range within which stimuli will be perceived as sound. experiments conducted on large groups of animals in conditions thought to be average for the particular type of commercial operation. fungi that attack plants that grow in the field. See also storage fungi. the area of a slide visible under the high magnification system of a microscope. a region in which an organizer influences adjacent tissue to become a part of a total embryo. the area of a slide visible under the low magnification system of a microscope. an embryonic region out of which definite structures normally develop. a trial to which additional segments are added as results are obtained in original segments, e.g. concentrating efforts on aspects of the work which appear to be promising. the area within which stimuli will produce the sensation of sight with the eye in a straight-ahead position. Q. My mother works in the medical field. I don’t want to discuss with my parents.I would appreciate your answer. I have some of the symptoms of ADHD for the past recent months. I am aware of the symptoms and now I feel the symptoms in me. People only notice these things as funny little quirks but this affects me severely. My mother works in the medical field. I don’t want to discuss with my parents. I would appreciate your answer. A. You are not making use of your mother’s help at the right time. I shall suggest you to discuss your problem with your mom. She can offer you the right support and guidance. I doubt whether she possess experience in the area of your problem. But it is wise to discuss this to your parents. This may also be the reason for you having developed the symptoms of ADHD (not being social). Feel free to discuss with your parents. None pretended to collect the game, which lay scattered over the fields in such profusion as to cover the very ground with fluttering victims. Whatever Tess's reasoning, some spirit had induced her to dress herself up neatly as she had formerly done, and come out into the fields, harvest-hands being greatly in demand just then. The girl was given but brief opportunity for further observation of the pitiful creatures in the enclosure as her captor, after having directed the others to return to the fields, led her toward the tower, which they entered, passing into an apartment about ten feet wide and twenty long, in one end of which was a stairway leading to an upper level and in the other an opening to a similar stairway leading downward. I know nothing but that she was found in the fields and that I caught her after a fight in which she slew two rykors and in which I slew a Moak, and that I take her to Luud, to whom, of course, she belongs. As they proceeded they met a greater number of the inhabitants of this underground world, and the girl noted that among many of these the metal and harness were more ornate than had been those of the workers in the fields above. Commanded by a lieutenant, the field force has six to eight individual squads, each comprised of a sergeant and seven officers, that respond as a highly disciplined and cohesive disorder-control force. He goes on to describe the first hydrocarbon discovery at the West Sole gas field in 1964 in the Permian Rotleingendes in the southern North Sea. It is not uncommon for a well-thought-through marketing strategy to be only partially communicated to sales management and field staff. Most important, Field advocated a groundbreaking jurisprudence of unenumerated natural rights. Uniformity of electric field over the decay volume and 2.
a search facility that includes only resources related to the field and that allows searching by title, author, subject, etc. The latest weakening of the magnetic field suggests that Earth's unseen armor may end up growing so weak that it will disappear briefly and then strengthen again in the opposite direction.